Blueberry Quick Bread – this easy quick bread recipe is full of blueberries and has less added sugar! 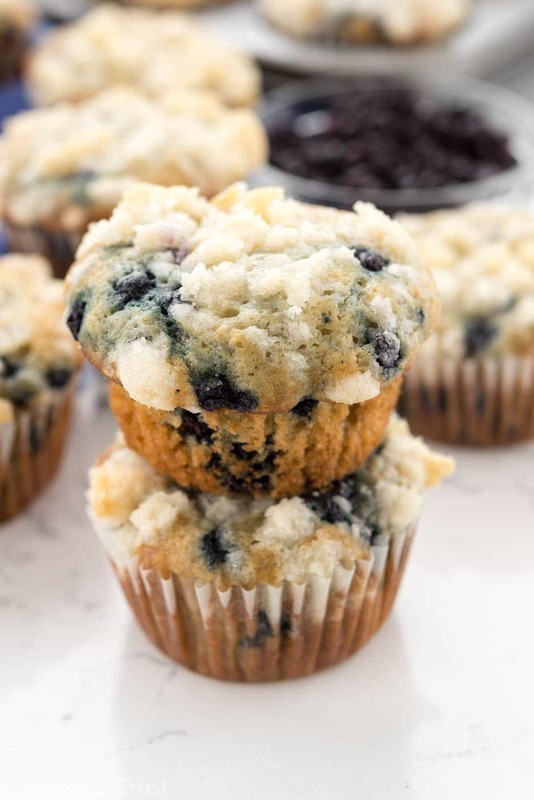 It’s the perfect breakfast; like a blueberry muffin, but in bread form! You know what happens to me in late March/early April? Spring cleaning fever. Even though I hate cleaning, organizing, and decorating I all of a sudden get the urge to do it all. The mess in the garage bothers me, my office mess is irritating, and I decide to redecorate my house. This year has been no different: Mel has taken two loads of cardboard to the recycler, I’ve taken 2 full carloads to good will, the clutter in my office is overwhelming even though I clean it every week, and I decided to change the colors in my family room to teal and coral and royal blue (to match family photos we had taken at the beach). It took me three tries before I found a set of curtains I liked. I ordered a teal media cabinet which I’m in love with. I accidentally ordered two coffee tables which turned out to be a blessing in disguise because I didn’t measure and it’s smaller than I wanted, so we’re going to use both. Now I need a new rug, new throw pillows, and some coral colored accessories. Spring is not only about my urge to clean, but it must be about my urge to spend money as well. Also: two coffee tables, curtains, and a new media cabinet produces a very large amount of cardboard. My garage is a mess…again. This EASY Blueberry Quick Bread is full of berries and it has less added sugar…so it’s the perfect anytime food. The other thing I think about spring is all the brunch that will soon be happening. From Easter to Mother’s Day, Sunday brunch is a spring tradition. 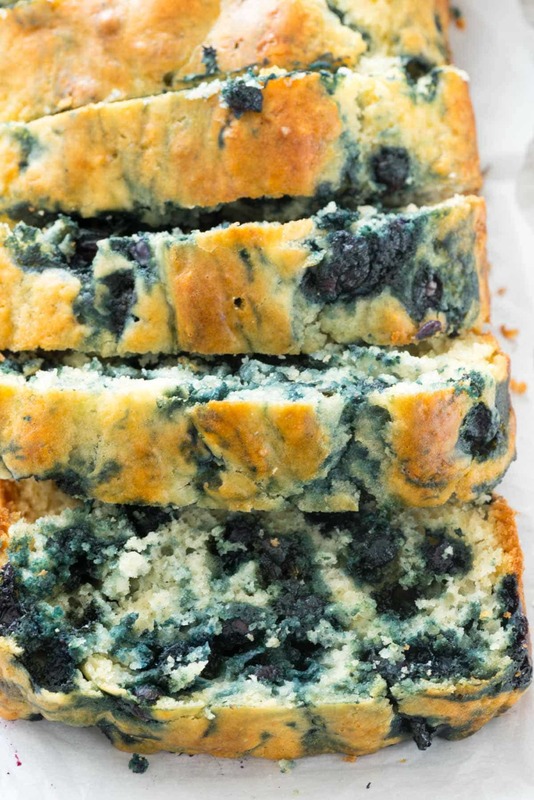 Blueberry bread is a great addition to any table, especially when it’s made with less added sugar so everyone can enjoy it. 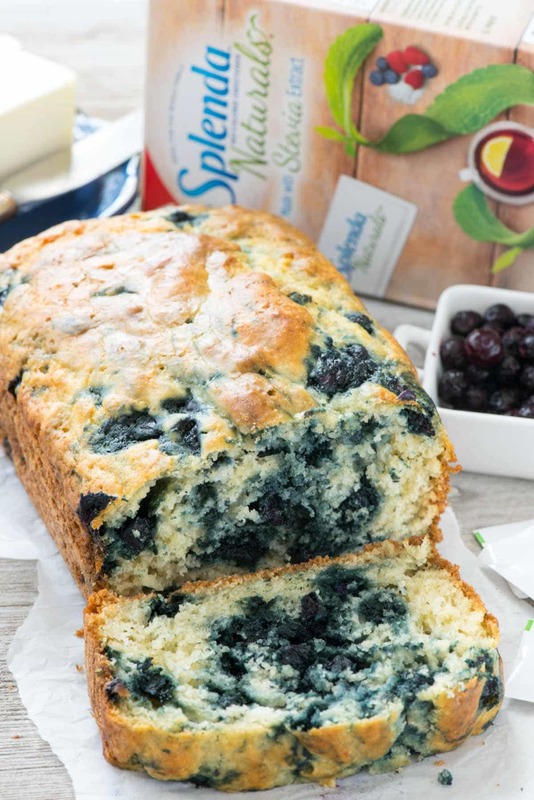 I started with my regular blueberry quick bread recipe (which I posted eons ago and am not even going to link because, OMG those photos) and I swapped out the sugar for SPLENDA® Naturals Stevia Sweetener. SPLENDA® Naturals is a better tasting stevia product and has no calories and no artificial ingredients. SPLENDA® Brand substitutes cup for cup with sugar and since I only had packets, I used their handy conversion chart to see that I needed 18 packets to make this bread recipe. Substituting for sugar can often affect the brownness, texture, and rise of a baked good. For that reason I used buttermilk in this recipe, as well as a combination of baking powder and baking soda. This ensured a nice tender crumb and rise for the bread. It turned out just like the original recipe, but with less added sugar! I’m excited to be working with SPLENDA this year because my dad isn’t supposed to have any added sugar. I’ve been meaning to create some recipes for him and this will get me to do that! 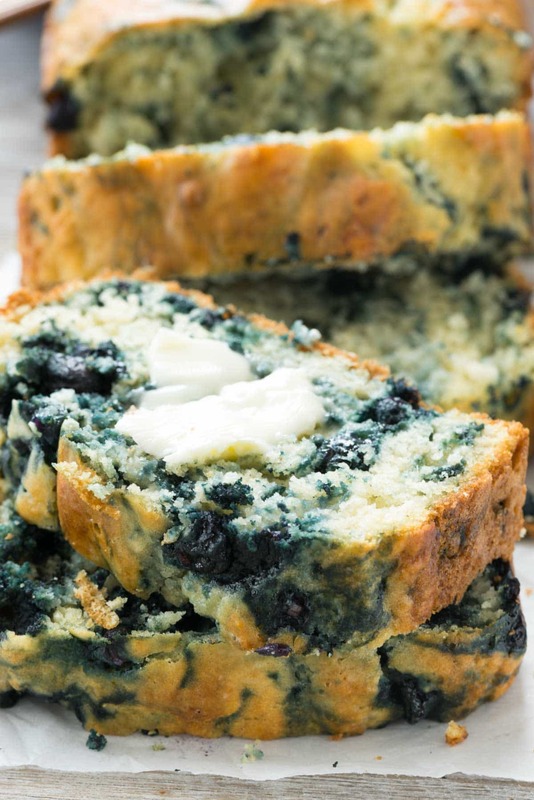 We all enjoyed this blueberry quick bread; it’s like a blueberry muffin in a loaf pan. It was great alone or with a nice pat of butter melted on the top. Jordan and I both ate it for breakfast and snack for a few days, although it tasted better fresh on the first day I made it. Because we’re picky with our blueberries, I used the “wild” type blueberry, that is smaller. They come frozen, and I didn’t fully thaw them. You can use regular sized blueberries, fresh or frozen, just make sure to remove any chunky pieces of ice if they’ve been frozen awhile. The blueberry quick bread bakes up nice and golden and moist and is the PERFECT spring brunch recipe! 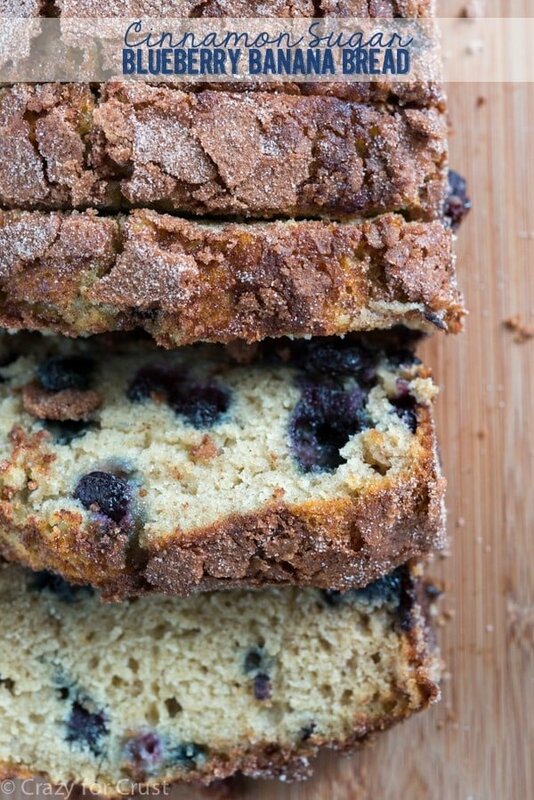 Blueberry Quick Bread - this easy bread recipe is full of blueberries and has less added sugar! It's the perfect breakfast; like a blueberry muffin but bread! Preheat oven to 350°F. Spray an 8x4" loaf pan with nonstick cooking spray. Whisk flour, baking powder, baking soda, and SPLENDA in a medium bowl. Set aside. Stir together oil, lemon juice, eggs, buttermilk, and vanilla. Stir in dry ingredients just until mixed. Fold in blueberries. Pour into prepared pan. Bake for 40-50 minutes, or until the loaf is browned and a toothpick comes out clean from the center. Cool at least 10 minutes before removing from pan and slicing. Best served within 24 hours of making. I want ALL the blueberry things right now. My in-laws are coming in town next week and this sounds like a great thing to bake for them! How much sugar would i use instead of stevia? I like the sound of this but cant stand the taste of other steetners. But i will keep this on hand as my Daddy is diebetic and i do not have any recipe’s to make just for him. So thank you for that. 1 cup of regular sugar! Oh i forgot to ask for my Mom or Me whomever makes this for Daddy how much Stevia would that be out of the bag if you do not have the packets as i know she does not. Even though she would use less than what it calls for as she cant get it in her head to follow a recipe for anything and then it comes out yucky. Just saying. Thank you. 3/4 cup of SPLENDA without the packets! Thank you. I appreciate it. Yours looks so wonderful. That’s amazing that there isn’t any sugar in this and that the texture came out so perfectly, too! I can just see how fluffy and tender it is. You nailed it! And great job on the decluttering and donating. That is SUCH a great feeling! Thank you! Now I just need to purge even more. hey girl – this looks so good! I couldn’t help but laugh about your “spring cleaning bug”! I wonder if it’s a certain personality trait that loves to bake and gets spring cleaning fever as well. I just cleaned out the garage the other day when I was supposed to be doing something totally different! 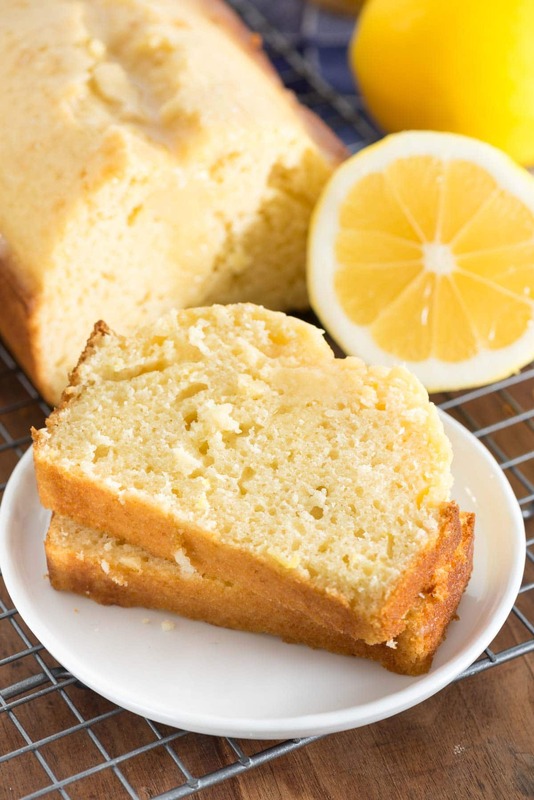 ha I love quick breads and happen to have some Stevia on hand from a different recipe I tried. Have you tried the recipe would work with raspberries instead of blueberries? I do love blueberries but I love raspberries more! 🙂 I may have to try this out this weekend with raspberries. YUM! I use liquid stevia instead of Splenda can you help with measurement. thank you I would really like to make this. I believe it would be about 1 teaspoon! Can I make this with almond milk instead of buttermilk? how. much is this in cups? I don’t buy packets!